Welcome to the MOST HEAVILY CENSORED blog in New Zealand [and across all other ZOMBIE regimes!] We’re GUILTY, above all, of TELLING the TRUTH, EXPOSING police BRUTALITY and govt CORRUPTION! More than 100,000 New Zealand kids were made wards of the state, and many now say they suffered sexual, physical and psychological abuse, while in the institutions. “This week, some of the survivors presented a petition at Parliament calling for a public inquiry,” said a report. “[It] would be inconsistent of me to publicly and enthuse support for a [new independent complaints system] when actually we don’t exactly have clean hands ourselves,” said Children’s Commissioner Judge Andrew [“Shady”] Becroft. “A man has been left seriously wounded after a stabbing in Lower Hutt, near Wellington. Saturday, July 8th: ONLY one road fatality report allowed by police, today, as of posting, despite at least 16 serious crashes reported locally. Friday, July 7th: NO road fatality report allowed by police, today, as of posting, despite at least 14 serious crashes reported locally. Thursday, July 6th: ONLY two road fatality reports allowed by police, today, as of posting, despite at least nine serious crashes reported locally. Wednesday, July 5th: ONLY one road fatality report allowed by police, today, as of posting, despite at least seven serious crashes reported locally. Tuesday, July 4th: ONLY one road fatality report allowed by police, today, as of posting, despite at least a dozen serious crashes reported locally. Monday, July 3th: ONLY four road fatality reports allowed by police, today, as of posting, despite at least 13 serious crashes reported locally. Sunday, July 2nd: ONLY three road fatality reports allowed by police, today, as of posting, despite at least nine serious crashes reported locally. A motorcyclist was killed in a crash with a car on Kawhia Road, near Hauturu, in Waikato. The crash occurred shortly before 3pm this afternoon. ONLY one vehicle-related fatality report allowed by police today. Stephen Kapeli went missing on Wednesday 5 April 2017. He was being treated in North Shore Hospital’s mental health unit but disappeared while out on “approved unescorted leave“. What really happened in Gore? Cyclone Cook swept south through Bay of Plenty and Hawke’s Bay on Thursday, felling trees and power poles, triggering landslips, cutting power to thousands and prompting evacuations. The man who was seriously injured in a crash on Taylorville Road near Greymouth around 8.55am yesterday morning has died. He was transported to Christchurch Hospital in a critical condition but passed away today, police said. To Auckland Councillor Cathy Casey: This shop’s sign is perfectly acceptable! 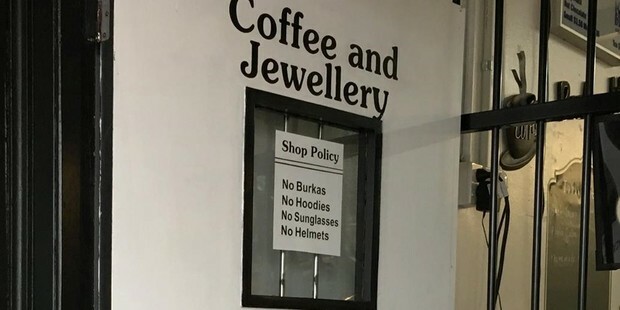 An Auckland Councillor has laid a complaint with the Human Rights Commission over a sign in the window of an Avondale shop banning people wearing burkas from entering. Burka does NOT represent Islam. They are perverse vestiges of the Ottoman Empire. Woman can dress modestly and appear perfectly decent, as required in Islam and Catholicism, without having to look ridiculous! Apart from the obvious safety reasons, concerning both the wearers and everyone else around them, burkas are demeaning to women; they belong to the 19th century Ottoman Empire. Afghan women in shuttlecock burkas wait outside a USAID-supported health care clinic. Wikipedia. A man flagged down a foreign motorist, believed to be an English tourist, in Greymouth this morning, “ranted” at him and then punched him in the face. “[The attacker] got out of his car, went up to the driver’s window, reached in, grabbed the car keys, snapped them,” police said. The incident follows reports of people removing keys from allegedly erratically driving tourists, earlier this month. “On Monday, a family of five from China, including a baby, was in a rental car seen repeatedly straying onto the wrong side of the road as it travelled south along State Highway 6 on the West Coast. “A motorist, who captured footage of the dangerous driving, later confiscated the driver’s keys and reported the incident to police,” according to reports. Meanwhile, a 26-year-old German tourist has admitted his careless driving caused the death of a Leeston woman in a crash near Springston on February 23. Daniel Muller, 26, appeared before a Judge in the Christchurch District Court and pleaded guilty to a charge of careless driving causing the death of mother-of-two Stephanie Anne Ellis, 54. Ms. Ellis, who had recently left her job as a teacher assistant at Hillmorton High School’s Upland Unit, had to be freed from the wreckage of her car by firefighters, but died at the scene, said the Press. An estimated 5 percent of all fatal crashes on New Zealand “death roads” are caused by foreign tourists driving carelessly.